The current set of skeins in Mandragora. And one more time! Back in stock. This one just blew me away when I saw it. A perfect combination of design and yarn; I just had to bring it in. 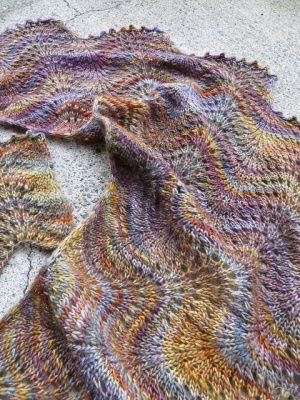 From the designer known as verybusymonkey here is her Glass Beach Shawl, in the exact yarn and exact colorway that you see here. Each kit will include one skein of the yarn. 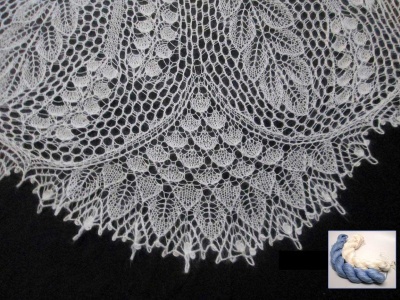 We have also added the option of including some 6/0 beads to add to the shawl. The pattern must be gotten via verybusymonkey's Ravelry page here. Growing up, my family would take camping trips up the coast from Los Angeles and one of the places we would visit was a place called Moonstone Beach in the Central Coast. There are a number of great places to see beach glass in California, the most well-known is probably Glass Beach even further up the coast. It is worked sideways and is highly adjustable to just about any yardage. 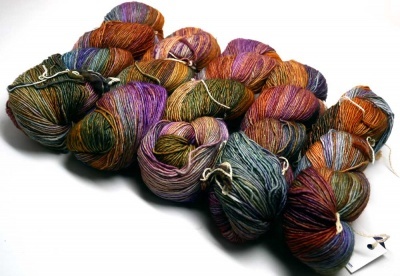 It also works FABULOUSLY for those beautiful hand-painted yarns that you don’t know what to pair with. 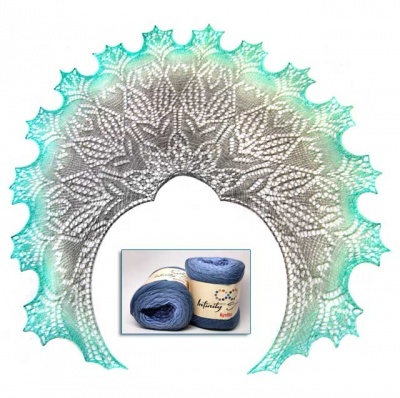 This design is easy to memorize and adjust for a bigger or smaller shawl. 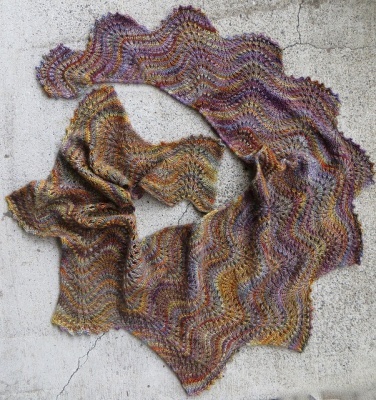 The shawl that you see on this web page was knit by Stephanie using one skein of Malabrigo's Mechita in the colorway called Mandragora. Each skein is 420 yards/ 100g and is 100% merino. Mandragora is a strikingly beautiful variegated colorway that has glorious sunset golds in varying tones interspersed with cool purples of changing hues as well. And that yarn and colorway is what we can offer. Each time we get it, the colors are somewhat different -- well, that is the nature of handpainted yarns. This batch is a glorious mix of gold , violet, rose, and green -- truly a most striking blend of hues. The finished size of Stephanie's original was 12" deep and 35" center to tip. 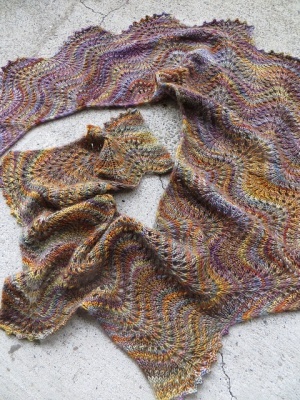 Because is is worked sideways (with an i-cord edging), you will be able to make a larger shawl if you so choose with the one skein that is this kit. . There are no beads incorporated into this design as written. If, however, you would like to add some, perhaps to the bind-off or to some of the yarn overs, we offer that option in one of the drop-down menus. This would give you, if you so choose, 20 grams of a size 6/0 beads chosen to work beautifully with the yarn. That's about 240 beads, + or -. You must must must get the pattern via Stephanie's Ravelry page here. This will ensure you get any future updates and the pattern will be stored in your Ravelry library.